Today I found out about the Tunguska Event, which was a 1908 explosion estimated to have been nearly 1000 times more powerful than the atomic bomb dropped on Hiroshima in 1945 and about 1/3 as powerful as the largest ever detonated atomic bomb, the Tsar Bomba. The Tunguska event occurred around 7:00 a.m. local time on June 30, 1908 near the Podkamennaya Tunguska River in Siberia. Witnesses saw a “blue-ish light, nearly as bright as the Sun, moving across the sky.” What followed was an estimated 15 megaton explosion which knocked over about 80 million trees in about a 1300 square mile area, forming a butterfly shape pattern. This also sent a shock wave throughout parts of Europe and Asia, registering as far away as England (about 4000 miles away). Further, the atmospheric pressure change was also significant enough to be measured all the way in Great Britain. Another interesting side effect of this blast was that, for several days after the blast throughout most of Asia and Europe, the night sky glowed. It was so bright that people as far away as China reportedly were able to read in the middle of the night by nothing but the glow of the sky. So what caused this massive blast? For a long time, it wasn’t precisely known. When the event first happened, it drew little interest largely because it happened in a very remote part of the world. It wasn’t until some 19 years later that Leonid Kulik, a Russian mineralogist, decided to go investigate, figuring that a massive meteorite must have hit the Earth. Kulik and his team had little trouble locating ground zero of the blast, despite it being 19 years later, due to the fact that the “trees acted as markers, pointing directly away from the blast’s epicenter”. However, once they got to the epicenter, they found a curious thing. There was no crater, as they had expected, and the trees were still standing in about a 3 mile radius circle at the center, but with their limbs, bark, leaves, etc. all completely stripped. So essentially, all these trees were just giant poles in the ground with all the other trees for miles and miles around blasted to the ground. For a long time, there was much debate over exactly what caused this, but today scientists are reasonably certain it was a comet, rather than an asteroid (see the difference between a comet and an asteroid) or other naturally occurring event. The comet must have been around 30-40 meters across (around 120 feet) and must have been traveling around 30,000-40,000 mph (about 55,000-65,000 km/h). As it traveled through the atmosphere, the air around it heated up to as much as 50,000 degrees Fahrenheit (about 28,000 degrees Celsius) causing the comet to look like a giant fireball streaking through the sky. Eventually, this also caused the comet to annihilate itself around 5 miles (8 km) above the Earth’s surface in a fiery blast that consumed the comet, which was largely made of ice. Thus, you get a massive explosion, but no impact crater or much of any apparent evidence of what caused the explosion, unless you witness it or start taking very careful soil samples and the like. It’s estimated that a Tunguska sized comet or asteroid should hit the Earth’s atmosphere about once every 300 years. The blast from it is more than sufficient to wipe out even the largest city on Earth, should it happen to blow up or strike around a major city. 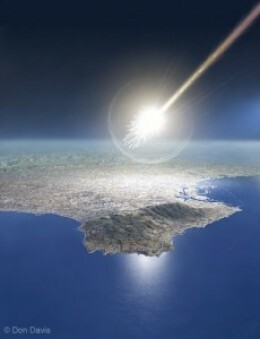 A comet or asteroid about 1/3 of the size of the Tunguska comet hits the Earth’s atmosphere about one or more times per year and produces a blast of around 20 kilotons, which is about equivalent to the nuclear bomb dropped on Nagasaki. Luckily, these tend to annihilate themselves quite high in the atmosphere. In order to get the Soviet government to pay for his expedition to go investigate this blast, Kulik convinced them that it must have been a meteorite and that meteorite would have been massive and made mostly of iron, so there was great potential for a huge supply of easily minable iron available that the Soviet’s could use. Remarkably, it appears that no one actually died from this blast, thanks to the fact that it happened in such a remote part of the world. However, many farmers and herders near the area lost their livelihood thanks to the explosion. It wasn’t until nuclear testing that these same blast patterns would be observed again, including the stripping of trees around ground zero with the other trees being blasted down. What’ happening here is the shock wave travels so fast that there is insufficient time for the branches to transfer the force to the main part of the tree before they are ripped off. For those trees in the epicenter, the force is all downward, so the result is simply that the branches and bark all get stripped, but the trees remain standing. Outside of the epicenter, the shock-wave hits the trees at more of a horizontal angle, so it flattens them. Eventually, Soviet experimenters were able to even mimic the butterfly blast pattern with a model forest and small charges. From this, they discovered that the blast must have occurred with the blasting body approaching at around a 30 degree angle from the ground and 115 degrees from North. It’s possible that other such explosions have happened in recent history, but unfortunately it wasn’t until around the 1960s-1970s that we had the capability to accurately detect these if they happened somewhere where people wouldn’t directly observe them, such as over the oceans of the Earth or the like. The U.S. built a nuclear bomb that was roughly equivalent to the Tunguska comet, in terms of blast power, being rated at around 15 megatons. This nuclear bomb was named Castle Bravo and was detonated on March 1, 1954. The Tsar Bomba (see video showing the detonation below), the largest nuclear bomb ever detonated, had a yield of around 50 megatons. Originally, it was designed to have a yield of 100 megatons, but was reduced due to concerns over nuclear fallout. Not only was it the largest nuclear bomb detonated, but it was also one of the cleanest, relative to the TNT equivalent output. It was detonated on October 30, 1961. The Hiroshima and Nagasaki bombs, on the other hand, were very small compared to the Tsar Bomba and were not that efficient. The Hiroshima bomb was estimated at about only 13 kilotons of TNT (1/3800th the size of the Tsar Bomba) with the total blast destructive zone only being about one mile in radius. Including resulting fires, it destroyed about 5 square miles of the city or about 69% of the buildings, killing 70,000 people upon detonation with an additional 70,000 seriously injured. Around 90% of all medical staff and facilities were destroyed in the explosion itself; that, combined with the effects of radiation burns and sickness, contributed to about an additional 150,000 people dead at various points thanks to the blast, though many survived for years to come before succumbing to cancer and other such sicknesses brought on by heavy ionizing radiation exposure. Nagasaki, on the other hand, had significantly less casualties, partially due to the fact that conventional bombs were dropped on it before hand, so many of the people, particularly school aged children, were evacuated from the city by the time the nuclear bomb was dropped. This explosion was 21 kilotons, with casualties reaching a still staggering number of around 40,000 people instantly, with around triple that number estimated overall. Before the Hiroshima and Nagasaki bombs were dropped, the U.S. government warned the Japanese, though not directly mentioning the nuclear bombs, and asked them to surrender. The Japanese of course refused, as, at that point, they were ignorant of the successful development of a nuclear bomb and, thus, had no reason to think the U.S. could follow through with their threat to utterly destroy Japan, if necessary. The U.S. had originally planned a series of much larger nuclear strikes that would happen in quick succession after the Hiroshima and Nagasaki bombs, wiping out most of the major cities in Japan, had the Japanese at that point not agreed to surrender. It’s currently noctilucent cloud “season,” and they’ve become more commonly seen in Northern latitudes in recent years suggesting an up-tick in atmospheric detonations of meteors and such. tunguska event was a nuclear explosion. also it changed Direction.